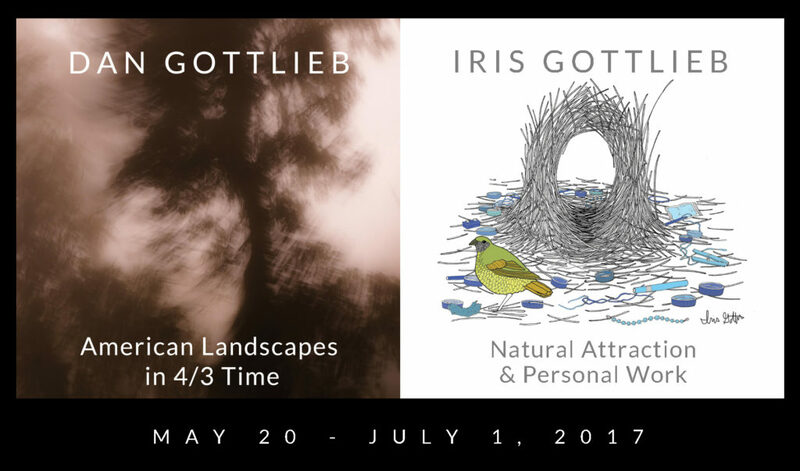 and Iris Gottlieb: Natural Attraction & Personal Work, open at Craven Allen Gallery on Saturday, May 20, with a reception from 5 to 7 pm, and continue through July 1. The artists, father and daughter, return to Craven Allen Gallery with profound meditations on the importance of nature and what it means to be human in these uncertain political times. “As America’s civil society erodes with terrifying speed and facts are re-cast as fake, it might seem trivial to dwell on nice pictures of nature. Or – just perhaps – reflecting on nature’s grand experiment now is more relevant than ever,” says Dan Gottlieb of American Landscapes in 4/3 Time, his new exhibition of mixed media work which combine photography, painting, and craftsmanship into enigmatic landscapes. 4/3 refers not only to Dan’s camera, but to a jazz rhythm which he sees reflected in nature’s endless improvisation: “… fixed and shifting patterns of light and form.” Gottlieb has had ample opportunity to reflect on the intersection of art and nature; as director of planning and design at the North Carolina Museum of Art, he is responsible for guiding development of the Museum Park. 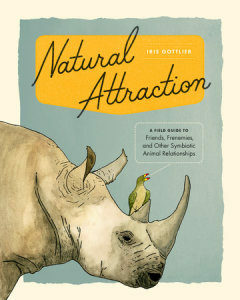 In the upstairs gallery, Oakland-based artist Iris Gottlieb (Dan’s daughter) celebrates her new book on unusual, symbiotic animal relationships with work from her new book Natural Attraction. But in addition to these quirky and visually exciting drawings, she presents an even more compelling and intimate aspect to her show, Personal Work, in which she delves ”… into the world of having mental illnesses, my queerness, and ways to visually explore intimate and vulnerable experiences.” The resulting mixed media pieces are revelatory. Craven Allen Gallery is located at 1106 ½ Broad Street in Durham. Gallery hours are from 10 a.m. to 6 p.m. Monday through Friday, and 10 a.m. to 4 p.m. on Saturday. 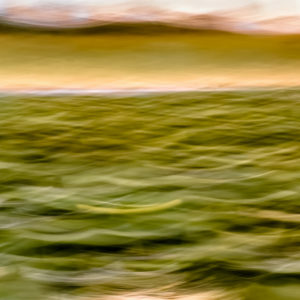 For more information, please call the gallery at 286-4837 or visit www.CravenAllenGallery.com. As America’s civil society erodes with terrifying speed and facts are re-cast as fake, it might seem trivial to dwell on nice pictures of nature. Or – just perhaps – reflecting on nature’s grand experiment now is more relevant than ever. My own interest in and appreciation of nature’s ever-changing patterns deepens with the years. Our planet is an incredible laboratory of bio-chemical chance, evolution, and pattern – all in motion. These pictures attempt to evoke a personal view of nature’s fixed and shifting patterns of light and form. 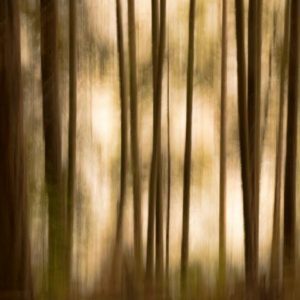 I confess to photographic tendencies of a late 19th / early 20th Century Pictorialist, crafting soft-focus landscapes imbued with a certain romanticism, albeit made with my own processes, and with ample physical manipulation. I’m most comfortable with one foot in photography, one in painting, and a third in design and craft. Landscapes in 4/3 time: Jazz is so interesting – any good tune has literally endless variations. I think its structure can be an apt metaphor for my perceptions of nature’s cool improvisation: an endless interplay of fixed and variable ingredients. Walking a forest’s shifting light, energy is syncopated with predictable and unexpected variables. A great tree’s awesome form bends in the wind. Leaves scatter in gorgeous patterns. Shadows shift and I walk in rhythm with a 4/3 camera to an upward swing and long exposure. If lucky, a good landscape is composed with the promise of art – and relevance. Recent work continues a decades-long interest in constructing photo-generated pictures through movement, using combined studio processes. Pictures presented here are made utilizing an original method. Images are reverse-printed on acrylic sheets and painted. The surface is then sanded to a matt finish. 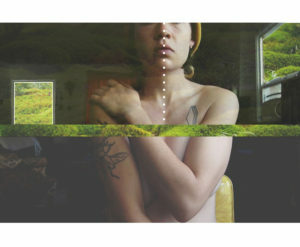 The process of combining photography, painting, and craftsmanship is core to my work. Photographic images are made with hand-held Micro Four Thirds format cameras and lenses. Dan Gottlieb was born in New York City and lives in Durham, NC. He studied art and biology as an undergraduate, and holds a Master’s in Art Administration. He was a cabinetmaker before beginning his long career as a museum designer. Since 1990, Dan has directed planning at the North Carolina Museum of Art and guided development of its Museum Park. This body of work is a collection of images from my upcoming book, Natural Attraction: A Field Guide to Friends, Frenemies, and Other Symbiotic Animal Relationships, as well as other drawings created over the past year. The past year has been one of delving into the world of having mental illnesses, my queerness, and ways to visually explore intimate and vulnerable experiences. The second half of the show is images from my book about symbiotic relationships amongst creatures in the wild. The book aims to bring science to anyone who is interested through an accessible and visually interesting way. Iris Gottlieb is a freelance illustrator and layman scientist. Originally from Durham currently residing in the Bay Area, she grew up collecting dead and living things and has continued to do so, documenting and researching them along the way. She has collected 3,614 shark teeth. When not exploring, Iris works with museums, publications, groups, and individuals as a freelance illustrator, animator, and graphic recorder. She has had work published in Smithsonian Magazine, Darling Magazine, and many more across subjects. Over the past 5 years, she has worked with museums around the country, making scientific information more accessible and fun. Her mission as an artist is to make work that is fun, informative, non-intimidating, and vulnerable, and to provide a visual alternative to text information. As a queer female in the science world with no extensive formal background in the sciences, she hopes to encourage young people and adults (particularly girls, women, and queer people) to be interested in science, pursue it even if not through traditional routes of schooling, and be curious to explore the natural world in micro and macro ways.